What are the requirements for Zoom? Where do I go to download Zoom? How do I join or test my audio? How do I join by telephone? How do I request or give keyboard/mouse control? What if my video/camera isn't working? Go here on your Mac or Windows computer and you'll be prompted to download Zoom. To install Zoom on a Mac, please check that your Security and Privacy settings are set to Allow apps downloaded from Mac App Store and identified developers. How do I join or test my computer audio on a Mac? For computer audio, you must have a working microphone, such as the built-in microphone, a USB microphone or an inline microphone on a headset or headphones. You can test the volume and output of your speaker device by select "Test Speaker". If you cannot hear, change the output source by selecting a different speaker device. > Speak at a normal level and check the Input Level meter to see if your computer is registering your voice. A green bar will raise and lower as you speak if it is working correctly. If the audio is not registering, change the input source by selecting a different microphone from the drop down list. 3. 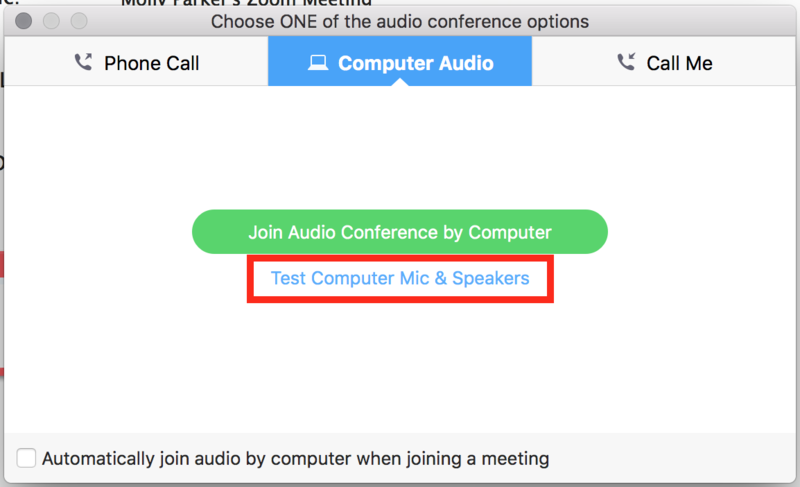 If you would like to check your audio connection while already in a meeting, click the arrow next to the microphone on the left-hand side of the in meeting toolbar and follow the directions above. How do I join or test my computer audio on a Windows? 2. You can test your audio connection before joining by clicking the “Test Computer Mic & Speakers” link. The audio preferences will open. You could not connect to a network for video and VoIP/computer audio. 1. Join the meeting with a PC, MAC or iPad device. 2. The person sharing their screen must be on a PC or MAC. Next, select "Request remote control right". This will then send the other person sharing a notification asking whether or not they will allow you to control their screen. You will see a notification asking whether or not you will allow them to control your screen. To regain control over your mouse and keyboard, simply "click" anywhere on your screen. My video/camera isn't working for my Mac. How do I fix this? Make sure that all other programs that utilize the camera are not using the camera or are closed. Reboot your computer to ensure that the camera is not being used by another application. My video/camera isn't working for my Windows PC. How do I fix this? Visit your device's support and downloads page to update the camera driver.